Emily’s everyday life is shattered when a strange woman knocks at her door, begging for her help as a frightening meteor descends from the sky. In an instant, she’s whisked away to the mysterious House of the Lancasters, where she discovers she has a special gift: the inner light. Now Emily’s power is the only thing that can stop the dark disease that threatens to swallow the entire world. This deadly infection corrupts anything it touches: humans, animals, even plants and inanimate objects, turning them into violent monsters. Work together with your new family to fight back and restore the world, before it’s too late! 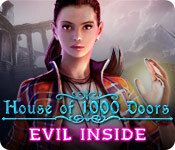 House of 1000 Doors: Evil Inside is rated 3.4 out of 5 by 32. Rated 5 out of 5 by Rwabbit from Best HOG I've played... ...and I've played a lot of them. 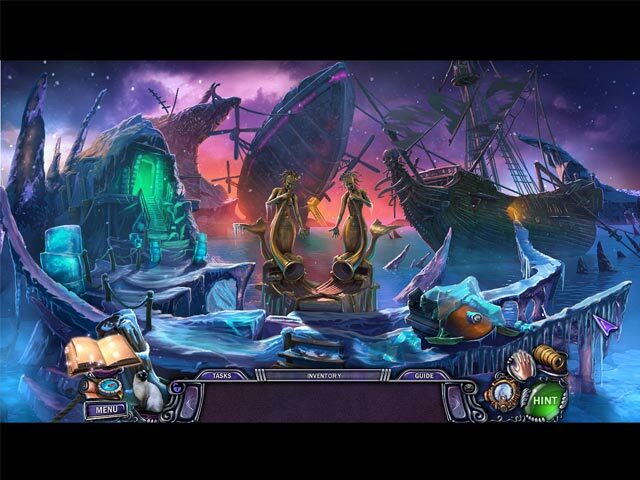 OK, I'll admit as a guy I can't relate to heroines in most of these Hidden Object Games (HOGs). So, usually I play the Edgar Allen Poe series and find them quite satisfying and true to the actual storyline. I purchased House of 1,000 Doors ... well, because the title promised a thousand doors, and I expected there would be a greater amount and variety of interesting puzzles, hidden objects, characters encountered, settings, etc. In short, it blew my mind. I was not disappointed! The game delivers much more than I expected. Just when I think the end must be getting near, a hole in the floor, or a crack in a mirror, or a small entry space behind the flap of a tee-pee opens up and Voila! -- yet another "door" appears in the least expected place …. and so my adventure continues. I don't play any HOG start to finish; I just bite off 15-20 minutes a day, sometimes a week. I've been doing that with this game for quite awhile; and although I know it will eventually be over (although it already seems like there have been at least 1,000 doors), I won't be disappointed because there are three more different House of 1000 Doors to purchase! Very creative, engrosing game that is sure to please. I highly recommend it, especially for its intriguing novelty. Rated 5 out of 5 by ninja226 from Fantastic game! This game has a lot to offer. It's not perfect in every respect, but excellent in the important areas. - artwork is excellent, except the characters look robotic and unnatural. However, voiceovers are good and characters speak at normal pace and not s-l-o-w-l-y (which drives me crazy) - for some reason the game does not fill up entire screen, so it's like having a little TV screen in middle of your desktop screen - 90% of HOPs have interaction, which is like a mini puzzle, and there is a lot of HOPs, great for those who love HOPs - mini puzzles are not that hard, BUT lacks a RESET button, which I did not like. In order to restart you have to go outside the puzzle, re-enter, and it "resets". As I said, annoying. Should have reset button for all puzzles. I found the story excellent. Easy to follow and coherent. There are many tasks and objects to find among scenes encountered, most are logical. This aspect is excellent and makes for a great sleuthing game. Pay attention to the glowing HELPERS at bottom of screen. You have Arya the cat who can fetch items hard to reach. 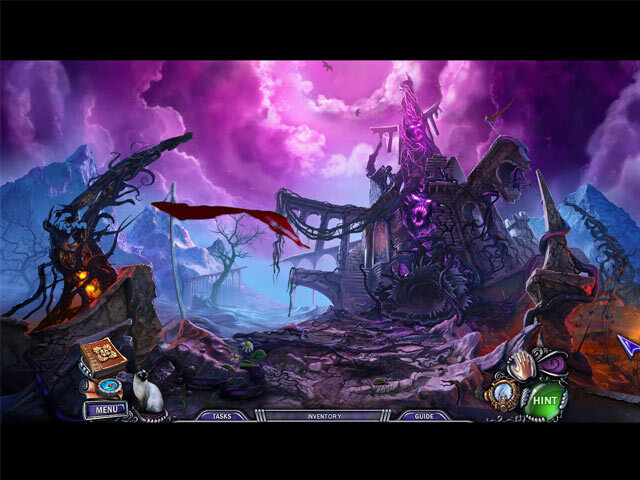 The healing hand is used when an infected person (draped in glowing purple vines) is encountered. The Magic Monocle/telescope allows you to see hidden items (like magic ink). The chronograph repairs items. Again, when these items glow or vibrate, you need to use them in order to progress. This is a long game. I loved the experience and would play again at another time. Rated 5 out of 5 by PaulaSan from Don't understand all the bad reviews I bought this game as a DD months ago and just got around to playing it. I thought, oh well, may as well see how bad it is... I, too, had been put off initially by the garish colors and the 'hand of light', but once I got into the game, I found that the garish colors were mostly left behind and the hand wasn't used all that often. ( I also found that when using the hand I didn't have to follow all the lines exactly. You just need to run your mouse down the lines quickly and touch the corners. They light up as you pass them to let you know you can go to the next corner... this made it a lot easier to do. ) The story was the usual kind of HOG plot... this time a new family member needs to save the 'new' family...but I just really enjoyed the game play once I played for a while! You travel through the mirrors to the 'warped' lands controlled by various new family members who had been made evil by the virus. I thought the different lands were very creative, well done artisticly and funnily logical. Anyway I recommend this game. It was nice and long and flowed very well at the same time it made you think a bit about what would follow logically. Once or twice logic didn't work and I needed to take a hint and found that the hint button worked very well in helping you figure out what you needed to do. I'm a puzzles lover and thought the puzzles were fun and sometimes challenging. The HO scenes which I usually find to be dull were as much fun as the puzzles.. and I started looking forward to the next one to come along. So just had to give a review (although I don't often give reviews) because the Devs obviously put a lot of time and effort into this game and I thought they deserved some 'cudos'!! It didn't deserve a lot of the negative comments it was given. I think sometimes people just don't let themselves give a game a chance... if the least little thing doesn't please them they 'trash' the whole thing. Try it and know that after the demo what follows is actually a really fun game! Rated 5 out of 5 by peachesmom50 from Believe the Hype!!.. This Game DOES NOT Disappoint!! I'm too lazy to address all of the negative feed back which I personally don't get.. but I think this game is beautiful, flows well, has a fun and creative story, no annoying music, it DOES have a map, the hint works just fine, and it was actually quite easy to play. I played the "custom" level. it's probably more challenging set at a harder difficulty level. As I said, I really enjoyed it... lots!! so don't believe the not so great reviews cause this game is pretty great. Rated 5 out of 5 by mohammad2015 from My most favorite game of the series This game has stunning visuals, fluid gameplay, nice story, the right level of challenge. Loads of fun. Rated 5 out of 5 by rpggramma from Enjoyed Very much! This is one of those games that has so much to do and so many places to go that you feel like you are playing a long time! I don't usually use hints, or the map to help find places, but I needed help with the map bc it is so much there, so many doors and rooms. When I found something I needed, I couldn't remember where everything went. The map is great, not much in the journal. Many, many puzzles and good Hops! Instead of a helper, you have several instruments to help you in your travels, which I prefer! I really enjoyed this, it was much fun! Rated 5 out of 5 by 9otters from Wish I Had Played This Sooner! BASED ON COMPLETED GAME I noticed that some others were disappointed because this entry wasn't like the previous ones. Not having played this line, I had no prior expectations and I LOVED THIS GAME! Brilliant imagination and attention to detail was apparent in everything, on every level. The only negative comment I have to make is that our heroine, Emily, is voiced by someone who sounds like she is reading her lines. Its a bit off-putting. Other than that, I can't think of enough GOOD adjectives to describe it! This game is a WHIMSICAL, ORIGINAL, ARTISTIC, MAGICAL, STEAMPUNKY, CHALLENGING, COLORFUL, FANTASTIC ride! And, it just got BETTER after the demo! I first thought the "hand of light" might get old pretty fast but that was NOT the case. Once I found that I didn't have to keep the mouse button depressed it was much easier. Easier still when I realized that all I had to do was "hit" the corners and made the bell sound happen for it to work. Much simpler than I made it in the beginning. Not a fan of "gimmicks" and "contraptions" I wondered about the two other devices as well. But, they were acquired progressively throughout the game and not heavily used at all. As a matter of fact, I sat there a couple of times wondering about my next move before seeing that I needed one! Our lovely "helper" was also used logically and not too often. The HOS were so interactive they played like puzzles and mini-games. Some were very challenging! Outstanding, UNIQUE puzzles and twists on familiar ones. Some easy, some not so. Most of the time the active areas were close together but there is a jump-map available that was very easy to use and not confusing. We all need a hint now and then and the hint system was perfect whether it was just a direction or an out-and-out answer on what to do. There was a surprise around every corner and it seemed like every door opened to MORE! I just kept going and going and going. I had to THINK. I had to LAUGH. I had to sit there in WONDER as I took this riveting ride that is House of 1000 Doors: Evil Inside. Hours and hours of entertainment for the price of a game coupon code! Thank you, BFG! There is NO DOUBT that I'll be playing and sharing this game again! Rated 5 out of 5 by pennmom36 from The House Of Lancaster Has A Virus! The House of Lancaster has allowed Emily, the last relative, to enter it's doors and not a moment too soon. A strange meteorite has targeted this quaint little town, spreading a deadly virus that is affecting everything, and everyone, including the House of Lancaster! Emily quickly discovers that she has a special gift, The Hand of Light. This "light" gives her all the power she needs to rid the town of this evil virus. (a simple click on the entity and then you drag the cursor over a series of shapes, to activate the Hand of Light.) Hopefully Emily can stop the virus and save the House of 1000 doors, who knows, she may decide to become a permanent resident, if the house allows it! I favor the Collectors Edition over this Standard Edition because there are 48 Evil Faces to find, one in each scene, when you find the Evil Face the Icon will light up on the inventory bar which will help you remember which scenes still have a collectible. The problem is, if you don't find the Face before leaving a portal, you may not get the chance to return and therefore lose an Achievement opportunity. Emily has a sidekick, her clever cat, Ayra (after the demons have been expelled) who is ready, willing and able to assist her in places that only a cat can reach. There are Plus items as well which require some type of interaction before using that inventory item such as solving a small puzzle or combining that item with another inventory item. There are a couple of things I did notice about this game, not every task is logical so you have to think outside the box at times, and most of the items you find in a scene are used almost immediately within that same scene. 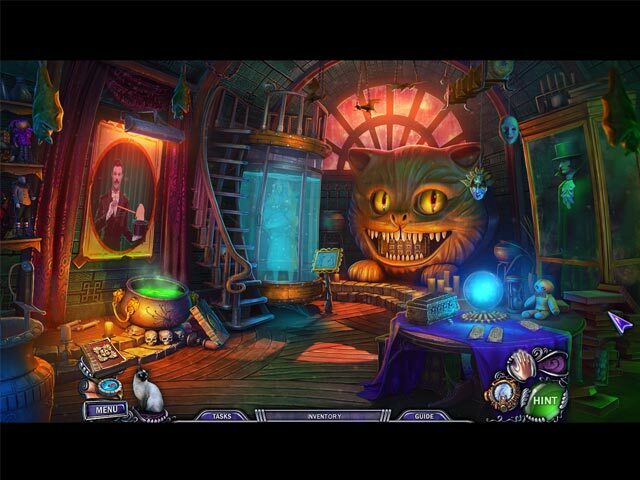 The Hidden Object Scenes are progressive Silhouettes, requiring you to find one item that matches the silhouettes shape shown, and then use that item within the scene to expose the next item and so forth until all items have been used. The Mini Games are typical for this dev, such as swapping train compartments with different spacings so that each row will make a complete train set when combined with the trains at the bottom of the board. The Collectors Edition has Wallpapers, Concept Art, Music, Achievements, Cut Scenes, Collectible Evil Faces, the Making Of, a built in Strategy Guide and a Bonus Chapter, enjoy!